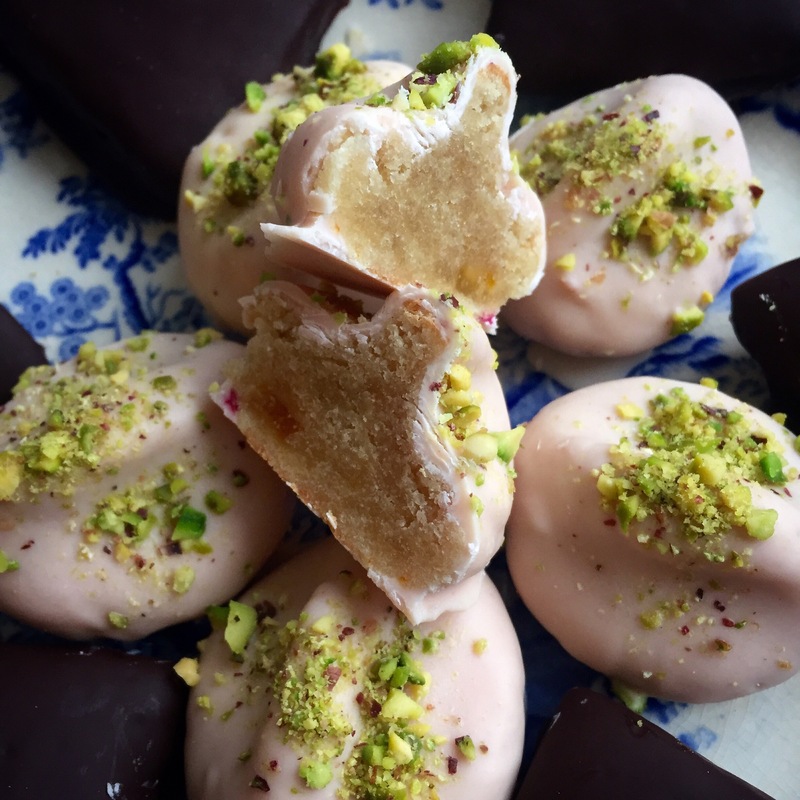 These delicious baked marzipan sweets play part of the essential Neapolitan Christmas ‘dolci’ along side other antique and traditional biscuits mostaccioli, susamielli and rococo. The name Divino Amore derives from the nuns of the Divino Amore convent in Naples, who would make these delicately scented sweets to order by nobility. My recipe reduces the massive amount of sugar usually called for and adds orange zest and crushed pistachos for extra Mediterranean sparkle. These marzipan cookies make for a great festive present. Parcel them up and spread the divine love! A handful of finely chopped pistachios. Preheat the oven to 200 degrees C. Place water and sugar into a pan and simmer until sugar fully dissolved. Place ground almonds into a large bowl and make a well in the centre. Pour syrup on gradually, mixing with a wooden spoon until mixture resembles coarse crumbs. Turn out onto a surface and make a well in the centre. In a small bowl mix eggs with essence, peel and orange zest then pour onto almonds. Bring together gradually, combining with hands until mixture comes together as a well mixed dough. Break off small portions and roll into balls using your palms (should be slightly larger than a walnut). Press down lightly and create a pinched look on the top using index and middle finger. You could roll the dough flat and make festive shapes with cutters – stars or angels would be especially lovely if gifting. Place onto a baking tray lined with baking parchment. Bake in batches for 10 minutes then place onto a rack to cool. Meanwhile gently melt white chocolate in a bain-marie turning off heat once melted. Add enough food colouring to create a blushed light pink colour, mixing well. Immerse each cookie into the chocolate turning to ensure a good coating. I use meat prongs as they allow me to manoeuvre the cookies around while letting excess chocolate to drip back into the bowl. Lay onto parchment paper and sprinkle with chopped pistachios then place into the fridge to set.